Based in Fairfield, CT and 100% family owned, the Bigelow Tea Company pioneered the specialty tea category more than 70 years ago. The three-generational company takes pride in its heritage and successful growth from a one-product, entrepreneurial venture into America’s leading specialty tea company. Producing 2 billion tea bags annually, the Bigelow Tea line includes more than 130 varieties of Flavored, Traditional, Green, Organic, Herbal, Decaffeinated and Wellness teas – including its flagship specialty tea flavor, “Constant Comment”, an alltime American favorite. EARL GREY GOES GREEN: We've given classic Earl Grey a green tea update. Same deliciously citrus-y bergamot flavor as the original, but this tea has the mellow flavor of green tea, less caffeine, and a much higher dose of health-boosting antioxidants. PACK OF SIX BOXES: Stock up on your favorite Bigelow tea with this budget-friendly pack of 6 boxes. 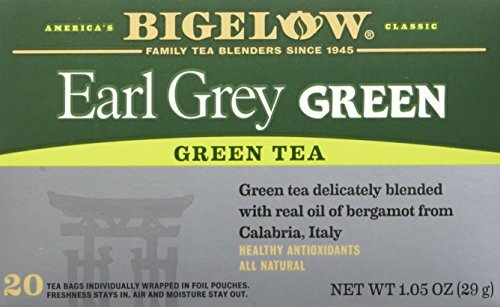 Gluten-free, calorie-free, and Kosher certified; Bigelow tea delivers all the health benefits of tea with none of the filler found in some other tea brands. TRY EVERY FLAVOR: There's a Bigelow Tea for every mood and every time of day. Rise and shine with English Breakfast, smooth out the day with Vanilla Chai, get an antioxidant boost from Green Tea, or relax and restore with one of our variety of herbal teas. INCOMPARABLE SINCE 1945: Since Constant Comment, Bigelow has been a leader in premium tea. Compare our teas to Twinings, Celestial Seasonings, Numi, Tazo, Good Earth, Yogi, Harney & Sons, Lipton, Teavana, and Taylors of Harrogate, and taste the difference.